"Dance Belts for Horseback Riding” - by “Deepseat"
Lightweight and flexible, this sleek looking model is made from MStevens proprietary 6-way stretch spandex fabric called ‘Milliskin'. That makes this dance belt extremely stretchy, which can be both a blessing and a curse. MStevens takes a bit of extra care with the design, adding an additional seam line into the 2" full circumference waistband to insure the elastic won't roll over inside. It hides perfectly under tights. Even under a unitard, there’s no show-thru dance belt outline. However, there is no padding layer, just a double layer of spandex in the pouch, so some “twig and berries” detail replaces the traditional dance belt round mound. The thong is the narrowest of all dance belts tested so there's no feeling of excessive material between your legs, but that also means it rides extremely deep. No problem while wearing it, but taking it off can literally be a pain! The MStevens is considered by many to be the most comfortable dance belt available. I've received comments like "feels like you have nothing on" and "forgot I was wearing it". (Yeah right - I'll agree it's comfortable, but no dance belt feels like you aren't wearing one.) However the consensus - which I agree with - is that it just doesn't have enough support for jumping or partnering. The lack of a structured pouch can lead to internal shifting revealing undesirable anatomical detail. Perhaps, an MStevens dance belt’s best use is under spandex costumes, running shorts, and exercise tights where comfort is more important than totally firm ballet level support. 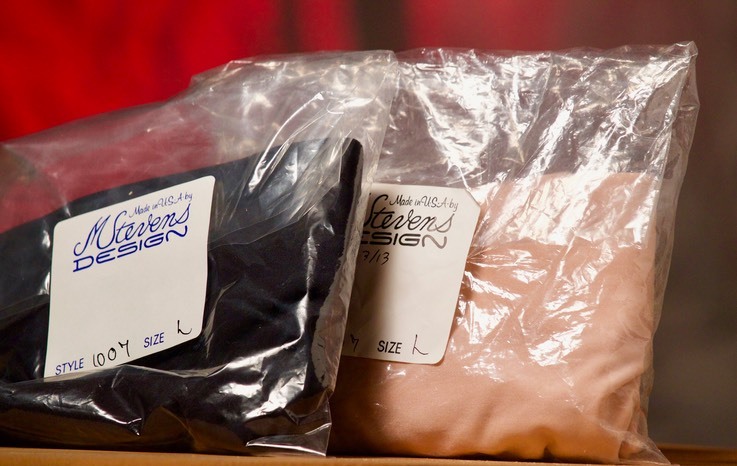 Very popular with slim younger dancers - an MStevens size S fits a boy with a 24" waist. For the rest of us, that means they are sized smaller than expected, so go up a size from what you think you need. Since it is constructed entirely of spandex, this dance belt will not tolerate laundry abuse. It's important to wash it in cold water and hang dry. Even with proper care, this dance belt tends to stretch and lose support over time. “UNCBlue94” says: I loved the idea of the moisture-wicking fabric (most of these are cotton), but the belt has no support. It covers okay, but it doesn't hold things the way that it needs to. “Male Student from Victorville, CA: Comfortable and durable, but the sizing runs quite large. I normally wear a medium with most of the other brands, but I had to get an XL with M Steven's. I wore these under my tights, and it was very embarrassing, because what I saw in the mirror was the outline of what was not to be seen. If you buy this dance belt for your ballet class, or for a performance, please don't. For other than ballet or performance, these will work fine for Halloween costumes, or any other type of none dance costume. "Stephen" from Chicago: Superbly comfortable, mediocre support. "David" from Valley Center, CA: The feel is FANTASTIC! But the fabric doesn't support well and there is bounce. "anonymous" from Pittsburgh: This dance belt is very comfortable. Feels as though you have nothing on. But it doesn't offer much support. I will probably continue to wear it, but I doubt I will be buying any more. "Justin": I used to use this dance belt in ballet class, but it leaves nothing to the imagination and it’s not suited to jumping at all. However it works great under running tights, in fact it’s about the only thing I’ve ever found that makes running tights useful. "Chris" from Pittsburgh: These are the best and most appropriate dance belts. When I'm dancing I'd rather not have a huge scratchy stiff band around my pelvis, just to prove something. These are also the most ergonomic in shape. Just make sure to get the appropriate snug size for you, and you're good to go. "Andy" from Southern California: I was looking for something to wear under tights for running and other fitness activities--not dancing. The fit and feel are incredible. Offers far more support than any other underwear I've worn - but I've never worn a dance belt before. You can't tell you're wearing them. "Joe": Though this dance belt is very comfortable, the nylon/spandex fabric does not support you and, if you buy it, expect to bounce during jumps and turns. “Chancie”: Fits good, stretches and comes back to shape good. Gives your boys a good hold while dancing. The thong string is thin so its not like having underwear wedged, you get use to the feel fast and its not uncomfortable.